Nearest: Tube Station: Bayswater 0.2 miles (0.4 km), Railway Station: London Paddington 0.7 miles (1.1 km), Motorway: M4 Junction 1 4 miles (6.4 km). Within a 0.5 miles (0.8 km) circle of the hotel are 4 tube stations (underground system). The Pembridge Palace Hotel London is situated between Queensway where there's plenty of shops and amenities, and Paddington Station with its direct train service to Heathrow Airport. A short walk away is Hyde Park and the fashionable shopping area of Notting Hill. Close by also is the famous antique market on Portobello Road. Public transport is within easy reach at the nearby Bayswater and Queensway underground stations. There are many restaurants near the hotel and in the surrounding areas. The Hotel is convenient to dining, shopping and entertainment venues. The guestrooms at the Pembridge Palace include bath (except basic singles), Coffee/Tea maker, Direct Dial Telephone, Hair Dryer, wakeup service, Iron/Ironing Board (on request), TV (with satellite connection in most rooms). Many bedrooms overlook the adjacent Prince's Square Garden. All rooms have a wireless internet connection (charges apply). Bedrooms accessed by electronic keycard. WiFi in bedrooms (charges apply). Single rooms described as Basic in the rates page have a shared bathroom. The nightly rate includes a complimentary continental breakfast and the hotel offers their guests complimentary coffee and tea in the lounge. The reception remains staffed 24 hours and a lift serves each floor. To the rear of the Pembridge Palace Hotel is a courtyard and garden which are pleasant areas for relaxing in the warmer months. WiFi in public areas. Compared to other London hotels: This hotel has been rated 60% by past guests. The London average is 80% and the average for 3 star hotels is 76%. Therefore this hotel is below average for its sector (star rating) . Milesfaster ranking: 819th from 866 London hotels, and 301st of 329 three star rated hotels. If you are looking for something a bit cheaper then take a look at the Travelodge Walthamstow. 5.6 miles away (9.0 km), gaining a satisfaction rating of 80% from its past guests with base rates starting at about £38. Prefer something with a higher guest rating? Then the 4 Star Amba Charing Cross may be one too look at being 2.0 miles (3.3 km) from the Pembridge Palace Hotel. The Amba Charing Cross has an extremely high guest rating of 98%, one of the best rated London hotels. 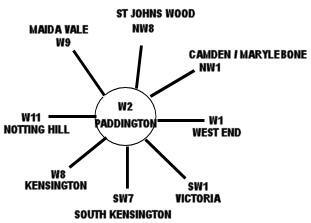 The fifty hotels that are closest to this location (Prince's Square, W2 postcode) which we list extend for a 0.7 miles (1.2 km) radius. Consisting of 1 five star hotel (rated 89%), 22 four star hotels (average rating 80%), 19 three star hotels (average rating 70%) and 8 two star hotels (average rating 66%). Top 3 star hotel is Phoenix Hotel at 82%. Of the 50 local hotels top rated is Royal Park Hotel (4 star) at 90%. Base Rates: We show you the average starting rates (base rates) in the area and break it down by star rating. Trouble with this is that base rates do not include special offers and limited low rate deals. However they remain a useful guide to general rates. The average base rate when considering all hotels in the surrounding area is £101 per night. Starting from £11 at Smart Hyde Park View Hostel (2 Star, 71%) with top rates of £720 at Commodore Hotel (4 Star, 60%). Rate averages listed by star level: Five Star average: £169, Four Star average: £146, Three Star average: £70 and Two Star average: £44. We rank hotels based on their guest rating but balanced for their influencing factors. We have ranked Pembridge Palace Hotel 47th (joint) of 50 nearby hotels and 19th (last) for the 19 three star hotels in the area. Our ranking for sheer lowest base rates is 2nd of 50 (1st of 19 three star hotels.). We calculate an overall ranking combining the rates and rating scores. This hotel ranks 12th of 47 for pure value for money (Smart Hyde Park View Hostel was top). Comment: Sold by the owners, Singaporean group Lum Chang Holdings Limited, in January 2017 to an overseas investor. On the 18th April 2016 a fire that started in the kitchen spread to the main areas of the hotel causing the whole hotel to be evacuated. 58 fire-fighters were involved in putting out the fire.